Endemism is considered for both Ethiopia and Eritrea because; Eritrea was a part of Ethiopia and shares the same flora and fauna. In Gullele Botanic Garden 233 species of plants were collected. Out of this 66 are found to be medicinal plants. Twenty eight species were found to be endemic to Ethiopia an Eritrea based on the flora of Ethiopia and Eritrea. Sixteen of them belong to herb, 6 shrubs, 2 trees, 2 shrub/tree, 1 herb/shrub and 1 climber. 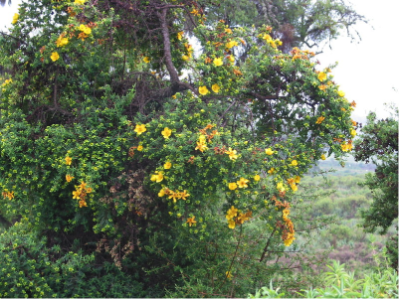 From total endemic species 35.71% of plant species are important for the preparation of traditional medicines, which comprises Inula confertiflora, Maytenus addat, Impatiens rothii, Kalanchoe petitiana, Laggera tomentosa, Lippia adoensis, Sideroxylon oxyacanthum, Solanecio gigas, Solanum marginatum and Vernonia leopoldii. Endemic plants in GBG were categorized in 11 different families. Asteraceae stands 1st with 11 (39.28%) species, Lamiaceae 2nd and Fabaceae 3rd with 5 (17.86%) & 3 (10.71%) species respectively, while others are having one species each. On the other hand, when the conservation status of each species was checked, following Vivero et al. (2005), five were vulnerable (VU) and two endangered (EN), 12 of them least of concern (LC), and nine were near threatened. 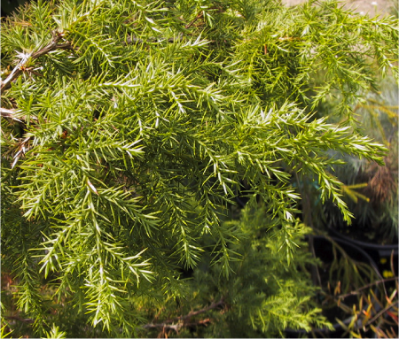 Juniperus procera, commonly known in English as African Juniper or East African Juniper, is a coniferous tree native to the mountains of eastern Africa from eastern Sudan south to Zimbabwe, and the southwest of the Arabian Peninsula. It is a characteristic tree of the Afromontane flora. It medium-sized tree reaching 20-25 m (rarely 40 m) tall, with a trunk up to 1.5-2 m diameter and a broadly conical to rounded or irregular crown. The leaves are of two forms, juvenile needle-like leaves 8-15 mm long on seedlings, and adult scale-leaves 0.5-3 mm long on older plants, arranged in decussate pairs or whorls of three. It is largely dioecious with separate male and female plants, but some individual plants produce both sexes. Hypericum ( /ˌhaɪˈpɪərɨkəm/) is a genus of about 400 species of flowering plants in the family Hypericaceae (formerly often considered a subfamily of Clusiaceae). The genus has a nearly worldwide distribution, missing only from tropical lowlands, deserts and polar regions. All members of the genus may be referred to as St. John's wort, though they are also commonly just called hypericum, and some are known as tutsan. Olinia is a genus of small trees and shrubs with ten species, the sole genus in family Oliniaceae. The species of Olinia are native to Africa, ranging from west Africa to South Africa. Leucas stachydiformis (Hochst. ex Benth.) Briq. Plectocephalus varians (A.Rich.) C.Jeffery ex Cuf. Senecio myriocephalus Sch.Bip. ex A. Rich. Appendix 3. List of medicinal plants used for human, scientific name, habit, family, part used, methods of preparation and application, condition of preparation, used to treat and routes of administration.